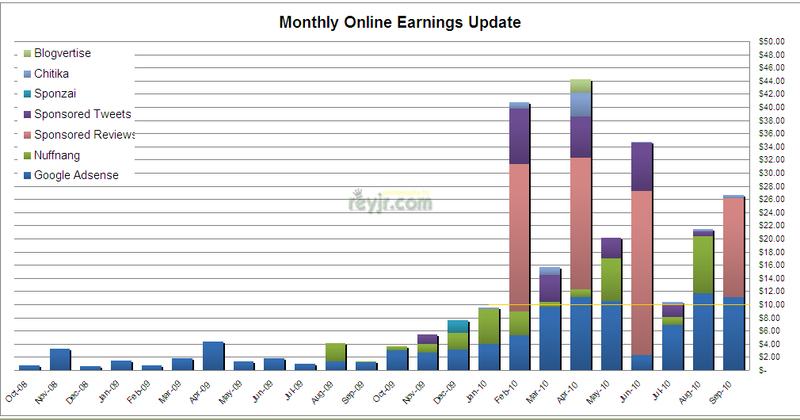 I've decided to blog about my monthly online earnings via my Twitter account, and my Personal Blog for the whole of 2010. I realize it is of somewhat a challenge to earn from a personal blog as opposed to a niche blog - I'm posting around once or twice a week about the things I would normally blog about, receiving around 100 to 150 unique hits per day. Since these are personal accounts, I have been quite discriminating in my choices of what to "promote". If you are a newbie like me, then read on and join me on this journey! If you are in the same situation, I invite you to share what you know and how your efforts have been fruitful. Google Adsense - $11.41 -The amount I earned this month brought my running total to $100.24, FINALLY qualifying me to received my first ever Google Adsense payout. How cool is that?! I am excited to receive the cheque in the next week or so! Some quick tips I can give you personal bloggers looking to earn on Google Adsense - pick a topic you're really interested and passionate about and blog about it to your heart's content! Treat it like a sort of niche, but always put your personal twist on it to make it more interesting! Sponsored Tweets - $0.04 - This service has waned in the last few months. I always get "The advertisers account is running a little low for this campaign right now. We'll try to Tweet this as soon as they add more funds." on pending adverts. Oh well. Nuffnang.ph - Php329.08 or around $6.50 - An OK showing for Nuffnang this month bringing my earnings for this service to an average of $3.40/month since January. Chitika -$0.73 - This service has earned for me approximately $8.00 in the last 10 months, as opposed to Adsense which earned me around $80.00. Hehehe. Still, I'm keeping them on, I haven't lost hope just yet! From January to October 2010, I have collected a total of around $242.50 (roughly Php11,640.00 in 10 months). That's an average of about Php 1,160 per month in 2010. Hey, that covers more than my twice a week Starbucks fix! :D Haha. March 2010 - Earning 10 in 2010" - March Online Earnings update! 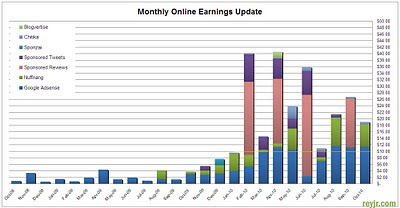 April 2010 - Earning 10 in 2010" - April Online Earnings Update! Learn SEO and just do it! That's all there is to it! Haha!